Oh my gosh, she's so funny! Happy 4th Cheynie and Janice!! Happy 4th July, hope you all have lots of fun. I love your pictures, very patriotic. Such a good girl for lying so still, that's not how we normally see her lol. Hope the fireworks are not too upsetting for her. 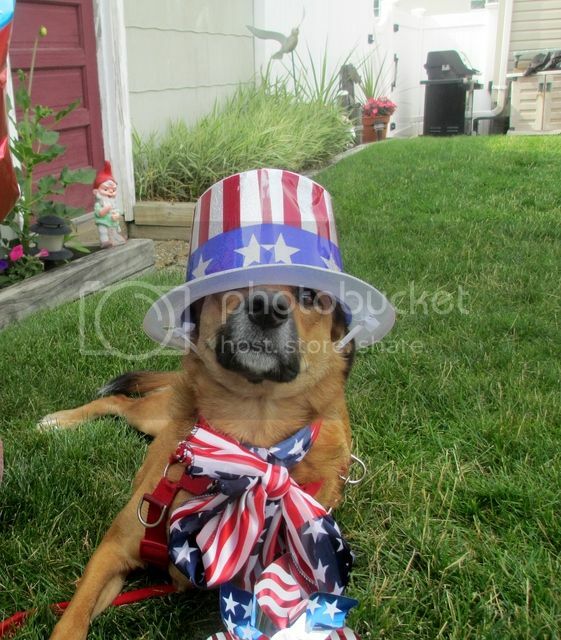 HAPPY 4th of JULY to you, Janice, Cheynie, and all others from the US! Love the photo of Cheynie...What a girl! Terrible drought in Pacific Northwest and even though there were many warnings, people still shooting their fireworks. 40/50 brush fires, a couple of houses burned down from fireworks. Our little town didn't have as much as usual but people were nervous and even though I gave Sadie some Rescue Remedy, she was freaked out. The one nice thing about July 1st in our area was that people seemed to take our really dry weather into consideration and there were absolutely no fireworks within hearing distance of me and I did not hear about any fires started from fireworks. We had rain most of the day of the 4th. However it cleared off by 8pm so there were fireworks, but not as many as in the past. 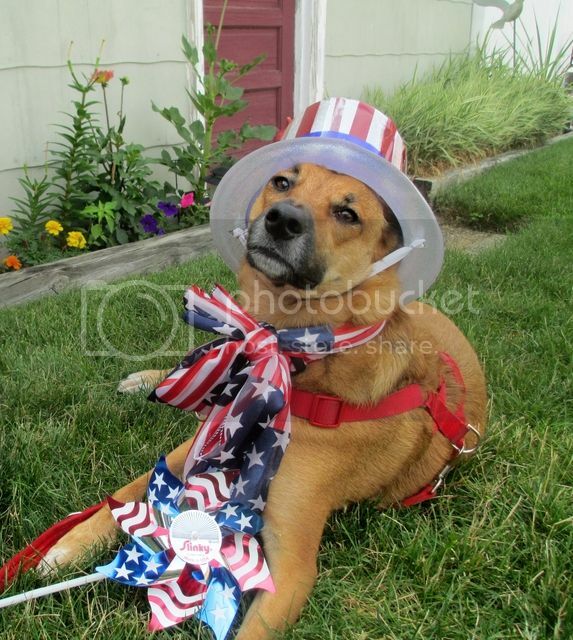 This was really Annie's first 4th. By all best guesses, she just turned a year old in June, so it was something new to her. When the fireworks first started, she looked at the window and up at the ceiling and growled. However, once she realized that they weren't coming inside the house she was okay. She laid on the floor next to the couch where my husband and Dunny were sitting and slept. Dunny did much better this year...I guess following Annie's lead. He just laid on the couch next to my husband and actually slept through it all. No freaking out.